Islands have returned to Lake LaVerne. The sustainable environments interdisciplinary graduate program's floating islands research project is back on Iowa State University's landmark lake for the first summer since 2015. While the project still measures nutrient uptake from the water, this year's research adds a new twist. Pollinator plants are being used to determine if floating islands could have a twofold benefit by helping threatened insects such as bees and butterflies. 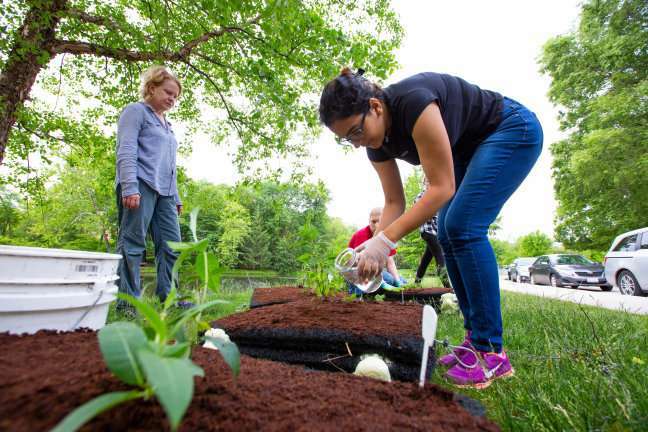 "This summer we're going to assess the performance of pollinator plants, which are different from the plants we used last time," said Mimi Wagner, director of the sustainable environments program and associate professor of landscape architecture. "These plants have not been tested in the literature for nutrient uptake." "Our long-term goal has always been to develop this practice for farmers and rural landowners to use on farm ponds," Wagner said. "Farm ponds are common in Iowa and many of those have high nutrient problems." Twelve floating islands, each a 2-foot cube, form a larger island on the lake. Bird netting surrounds the islands so geese don't eat the plants. The base of each island is formed with pond filter material and a layer of marine foam to provide flotation. Holes drilled into the filter material are filled with peat moss and used to contain the individual pollinator plants. This year, 12 pollinator plant species – a different species on each island – are being used for the project. Their roots wick up nutrients from the lake. ISU entomologists are providing insight into the pollinator plants, which include common milkweed, wild bergamot, New England aster and swamp milkweed; and associated insects. 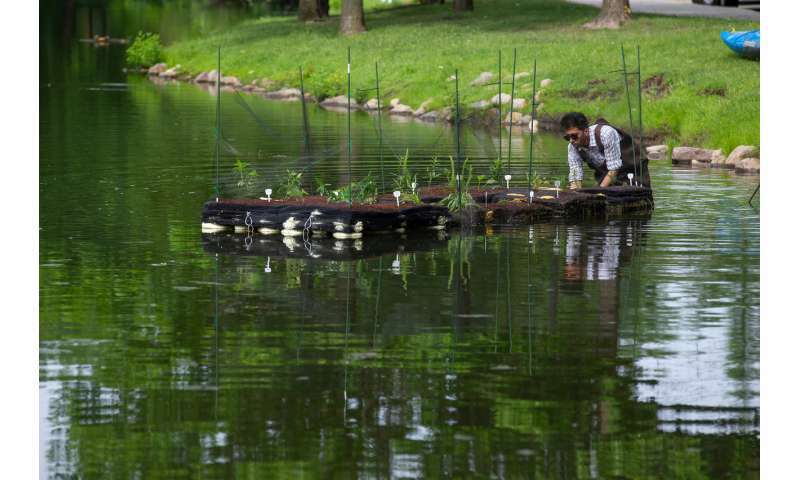 "Floating islands already help farm ponds reduce excess nutrient levels, so why not also help by providing more pollinator habitat acres, too?" Wagner said. You may have noticed that Lake LaVerne has lost some of its algae cover in recent weeks. Facilities Planning and Management says that's because they applied liquid aluminum sulfate (alum), which binds phosphorous suspended in the water and settles it to the bottom of the pond. This helps clear the water and slows the growth of algae, but it's a temporary treatment. "In the past, materials such as bamboo, concrete and polyester have been used to construct the island," Chen said. "My research goal is to come up with a cost-effective structural supporting system for an island with a given size." "Some of our research goals are to quantitatively examine how much improvement in water quality these floating islands can provide and to optimize the environmental benefits of the islands," Ikuma said.